1). Mainstay candle in Mulled Cider. 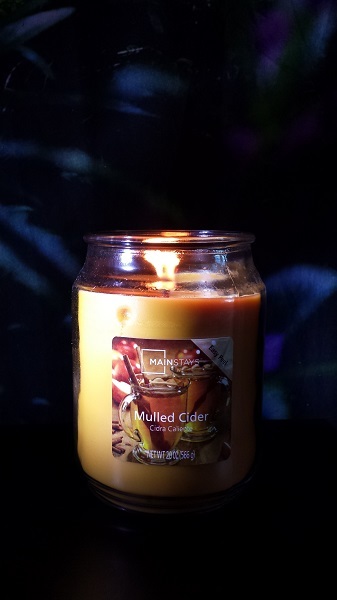 Mainstay Mulled Cider candle – autumn in a glass jar. This candle turned out to be a big surprise. It’s basically a $5.00 candle with the quality and fragrance pay-off of a $20.00 candle, and it can be found at Walmart, where we go after the gym sometimes, since it’s next door. I was doubtful when I bought it… I’ve had such meh experiences with other cheap candles that I’d stopped trying with them. I’m so glad I decided to take a chance on this one! This candle’s lovely aroma fills the room just as well as a pricier one would. I’m just so impressed. With its intense yet rounded fragrance of spiced cider, the Mulled Cider candle is fall-scented perfection for a fraction of the cost of a Yankee candle, or one from Bath & Body Works, or one from Crabtree and Evelyn, or elsewhere. 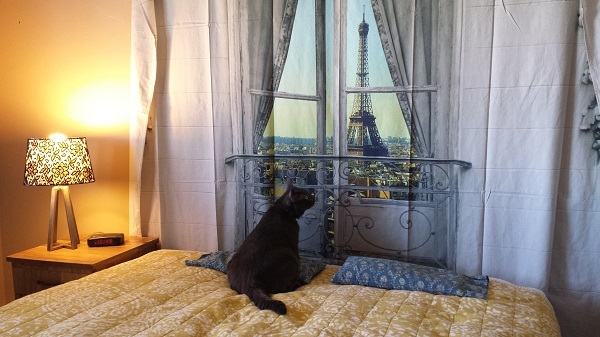 Ronnie James gazing at the Eiffel Tower in our Paris-inspired guest bedroom… don’t tell my parents he was on “their” bed, haha! SURPRISE! It’s the Eiffel Tower in our guest bedroom, haha! What can I say? I love the Eiffel Tower, and I thought it would be fun to do this room with our French houseguests in mind. When I recently wrote about the abundance of Eiffel Tower-themed things all over the place here in the States and listed a few of the Eiffel Towers we have in our house, I didn’t mention this particular one that’s printed on a fabric panel and serving as a headboard behind the bed in our spare room. This “tapestry” comes from Urban Outfitters. We have three others from them throughout the house… one in our bedroom (forest theme), one in my office (mystical sunset theme), and another in the guest bathroom (wrought iron country gate theme). Ronnie James knows he’s not allowed in the guest bedroom, so naturally, when we were distracted showing his Auntie Margaret around the other day, he seized the opportunity to dart in the second we opened the door. This photo busts Ronnie James in his big carpe diem moment of the month. He ran in, jumped on the bed and went straight to the Eiffel Tower. It’s not so strange, though… he is French, after all! 3). 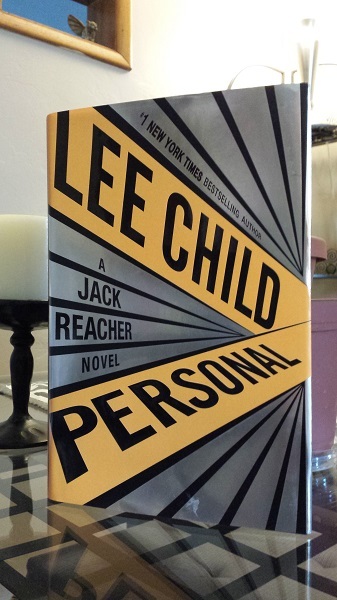 Personal by Lee Child. Because yes, Reacher is back, and this time, the shenanigans begin in Paris! I loved it, and I had an intimately thrilling moment when Reacher took his CIA companion through the Père Lachaise Cemetery in Paris and mentioned Jim Morrison’s grave, the subject of my “greatest first-world problem” post! As the two are naming several famous people buried at Père Lachaise, Reacher pointedly adds, “…and Jim Morrison… from the Doors.” I couldn’t believe it… Reacher brought me to the place I regretted missing five times. This is escapism at its finest. Thank you, Lee Child! 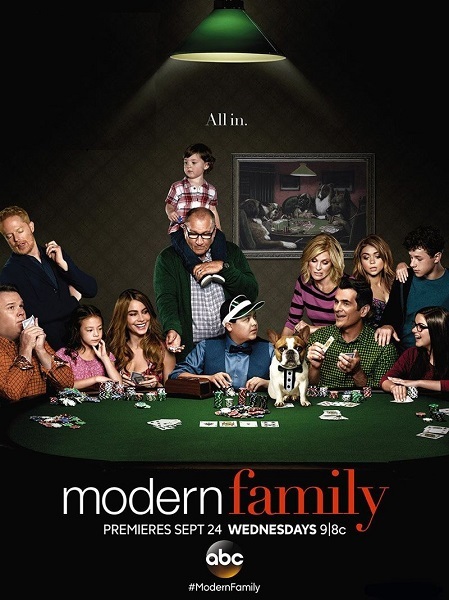 The start of our beloved Modern Family’s sixth season launched our fall television agenda, and the premiere left us cracking up, as usual! The particular humor in this comedy just does it for us, and that makes it pure gold. Comedic timing is a tricky thing to learn… one has to have an innate sense of it. There’s just so much talent on this set, and we just think the show is excellent in all respects. We’re so glad these crazy guys are back. 5). 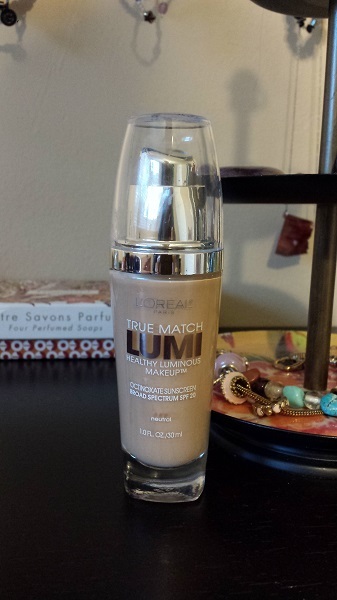 L’Oréal True Match Lumi Healthy Luminous Makeup. If you know me well, you know that I’m constantly on-and-off boycotting L’Oréal, and I don’t think I’ve ever used a foundation of theirs before… but it’s hard to find a foundation that I love (for a long time, I just used BB creams), so I decided to take a suggestion and try their True Match Lumi Healthy Luminous makeup. Frankly, in my opinion, it’s perfect. I love its lightweight feel and flawless finish, and its extensive range of shades makes it user-friendly for everyone. This medium-coverage makeup is a fabulous drugstore alternative to expensive department store brands. I once tried a sample of Chanel’s Vitalumiere Aqua foundation, and the L’Oréal True Match Lumi Healthy Luminous Makeup seems to be a good dupe for that lovely product. Win! 6). 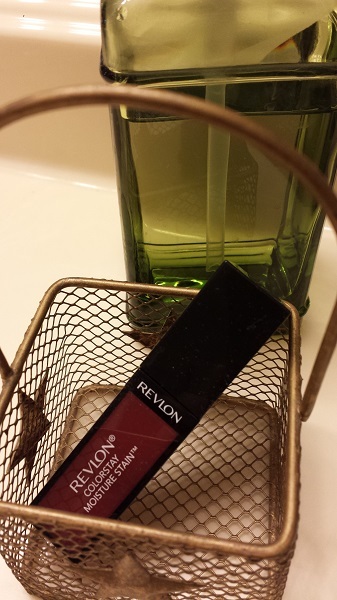 Revlon Colorstay Moisture Stain in Stockholm Chic (055). This is simply the best lip stain I’ve ever tried, and I do mean ever. It’s light and long-wearing, and it feels like I’m wearing nothing while doing exactly what a good lip stain should do – it leaves color on the lips even after it’s worn off, and, being less drying than most, it doesn’t gunk up in a patchy way when you reapply it. Not only that, but it actually comes in the perfect “my lips but better” shade… Stockholm Chic is a darker neutral that strikes that elusive balance between rust and wine. Sometimes I just apply lip balm over the stain after it wears off, and then it looks like a well-pigmented gloss. This is good stuff. 7). 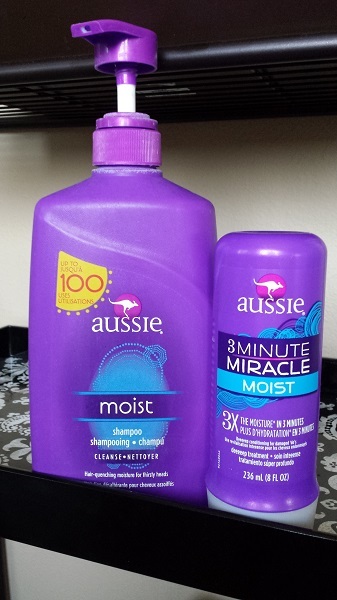 Aussie Miracle Moist shampoo and 3-Minute Miracle Moist conditioner. I’ve been using Aussie products here and there for years, including their 3-Minute Miracle conditioner that’s been around for a while, but their “Moist” line is newer, isn’t it? Or did they just re-name it? Whatever the case, I’m finding it to be quite wonderful these days. I have another brand of shampoo and conditioner in the shower that used to be my favorite, but I keep reaching for these Aussie products. I just re-purchased the conditioner. That’s saying a lot! 8). Lenny & Larry’s The Complete Cookie. Lenny and Larry’s The Complete Cookie in All The Flavors. Can we just start with dessert? Our gym got us hooked on these cookies by displaying them boldly on their exit counter one week. Thanks, gym. We’ve tried the lemon poppy seed (which tastes like cake), chocolate chip (really good chocolate chip! ), pumpkin spice (OMG amazing) and double chocolate, and Oh. My. Goodness. There are no words, my friends. No words. 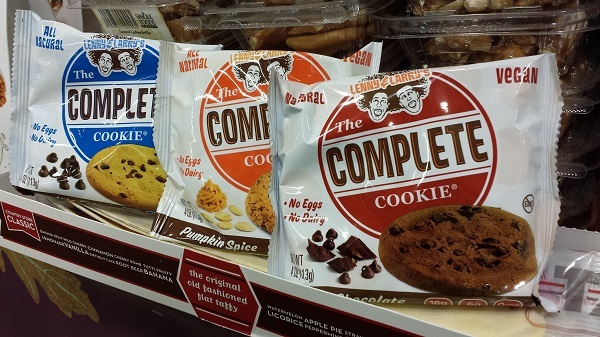 Our gym sells these vegan, organic, high protein and kosher cookies for a ridiculous price at $3.00 a pop, but we actually found them on sale at Whole Foods one day – three for $5.00! – so I couldn’t say I went to “Whole Paycheck” that day. I highly recommend these delicious cookies, but take caution… they’re huge, and the nutritional info label reveals that one cookie equals two servings. To save money and calories, I break them in half and store them in the freezer in individual ziplock bags. 9). Dave’s Killer Bread (Blues Bread). Dave’s Killer Bread Blues Bread… it’s to die for! About one-third of the employees at Dave’s Killer Bread are ex-cons. If that right there isn’t cool enough – who doesn’t love a company that gives second chances? – throw in the fact that the bread they make is completely out-of-this-world fantabulous. Our favorite is the Blues Bread. 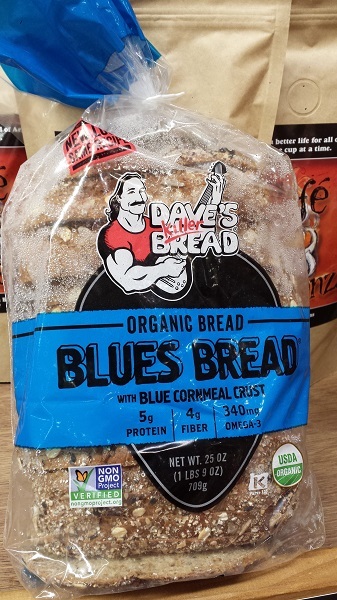 Inspired by Dave’s love of Blues music, Blues Bread® is rolled in organic blue cornmeal, giving it a crunchy crust and sweet flavor. It’s vegan and high in fiber, protein and omega-3 fatty acids. All of DKB’s breads are organic. 10). 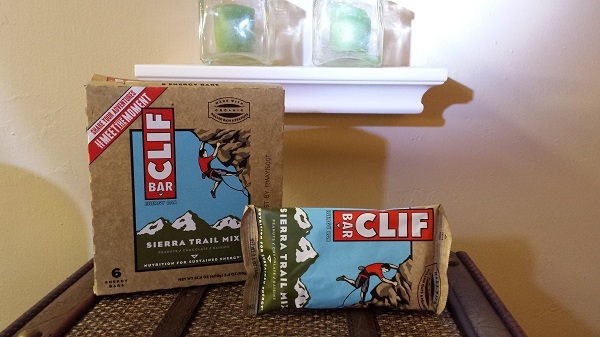 Clif bar in Sierra Trail Mix. Sierra Trail Mix Clif Bars. The classic Clif bars are a bit more calorie-dense than bars I’d typically consume, but they’re designed to supply energy while hiking (I think that’s how they got started, anyway), and sustainable energy means calories. The reason this gives pause for thought is that the Sierra Trail Mix flavor is so good, I don’t want to stop after eating after half the bar… I want the whole thing! We’re hooked on these bars. Clif bar flavors are hit or miss with me, and this flavor is most definitely a hit. Well done, Clif bar people. Well done. How does your “what I’m digging now” posts keep coming up so quickly? 😉 Well time goes way too fast! BUT October is also my favorite month! I used to use Aussie hair products. Maybe I should give them another try? I’m hooked on Herbal Eesence “Honey, I’m Strong” shampoo and conditioner. It smells so good too. Thanks Kristi! Always an interesting read 😉 Enjoy your parents visit and weekend!! Hi Colleen! It’s true… these monthly favorites posts seem to come every other day! September went in a flash, even faster than usual. I’ve heard great things about that Herbal Essences shampoo and conditioner, so now I’m tempted to try it. Remember that “Gee, Your Hair Smells Terrific!” shampoo and conditioner from the ’70’s? lol! I used to use that!! I don’t remember what it smelled like, now. Thanks Colleen… I’m glad you enjoyed the post, and thank you… it was a lovely weekend with my parents. =) I hope you had a great weekend, too! Have a wonderful Monday! Oh my gosh! How could I forget “Gee Your Hair Smells Terrific!” That brings back a lot of memories. I used it in HS. Except on the first day of my period! The shampoo scent would be so strong and I would be so nausous and always suffering with severe cramps, that it would almost make me throw up! I seriously have that ingraved in my mind lol!! Glad you enjoyed the weekend 🙂 Ours was great too!